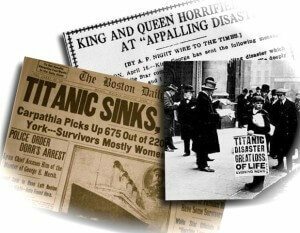 The world was shocked in the days following the night of April 14 of 1912, as the news spread of the sinking of the Titanic on its maiden voyage across the Atlantic. The vessel was the largest ship ever built up until then and it was touted as the safest. It employed the state-of-the-art technology of the time and was thought to be virtually unsinkable by some people. So confident were its builders in the seaworthiness of the vessel that there were only enough lifeboats provided for about half of the 2200 passengers and crew. The ships’ owners didn’t want the deck cluttered up with lifeboats they felt were not necessary. Consequently, over 1,500 either drowned or died of hypothermia when the ship sank in the icy waters of the North Atlantic. No one imagined that the ship would collide with a massive, immovable iceberg, or that its steel hull could be sliced through as if by a kitchen can opener. No one imagined that enough of its specially designed watertight compartments could be flooded and drag the ship under. That, of course, is exactly what happened. But the sinking of the Titanic was more than just a maritime disaster. Because of its luxury and opulence and the prestige imparted to the gigantic vessel by its ultra-wealthy passengers, the Titanic was a symbol of the progress of the industrial revolution and superiority of the gilded Victorian age of British culture. 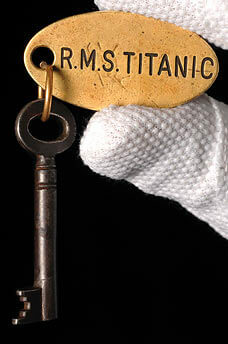 The world, in fact, followed closely the news of Titanic’s construction and launch. It was an event. Perhaps, the shock associated with the loss of Titanic might be comparable to the Challenger disaster. Coming just months before the outbreak of World War One, the disaster that befell Titanic was a blow to the Crown itself; not only marking the end of an era, but the tragedy seemed to be a harbinger of things to come. What made the loss all the more tragic was that it could have easily been prevented. It was nothing if not the end result of a series of human blunders and arrogance. Start with the fact that the collision took place on a clear starlit night. It is not as if the iceberg suddenly emerged out of a bank of fog. The question is: Why didn’t the lookout see the iceberg in time? One reason is that he did not have a pair of binoculars, which most assuredly would have been considered standard equipment. So why wasn’t the crow’s nest of the world’s most luxurious ocean liner outfitted with something as simple as a pair of binoculars? Actually, it was but they were unavailable. And why was that? Another contributing factor to the demise of the Titanic is that apparently the shipbuilder used inferior quality rivets that did not hold up under stress. Probably the main contributing factor in the disaster was that Titanic’s captain ignored repeated warnings that icebergs had been spotted in the immediate vicinity. On the day of the collision Titanic received no less than 20 iceberg warnings. Throwing caution to the wind Titanic was sailing at near full speed when the lookout first spotted the iceberg dead ahead. As an indication of the ship captain’s prevailing mindset, Captain Smith is quoted as saying some years before captaining the Titanic that he could not imagine any scenario that would cause a modern ship to founder. Apparently the captain lacked imagination. And then there was the foolish negligence of Stanley Lord, the captain of the California, which was only 19 miles north of the Titanic as it sank. The lookouts on the California saw Titanic’s distress flares fired into the night sky and reported it to the captain. He imagined the Titanic was shooting off celebratory fireworks and Captain Stanley Lord wouldn’t bother himself to investigate. But had he merely instructed his radioman to turn on the radio he would have received the mayday call in time to have rescued all of the passengers and crew. There are stories that the collision left chucks of ice on the decks of the Titanic, which a few jolly passengers scooped up and plopped into their martini glasses to cool their libations. Whether that is true or not, though, many passengers were certainly complacent before it became apparent that the ship was going to go under. But once the order to abandon ship was given first class passengers were given priority. Steerage passengers were kept locked below decks until most of the lifeboats were gone. This is confirmed by the survivor logs that show a disproportionate number of survivors were first class ticket holders. 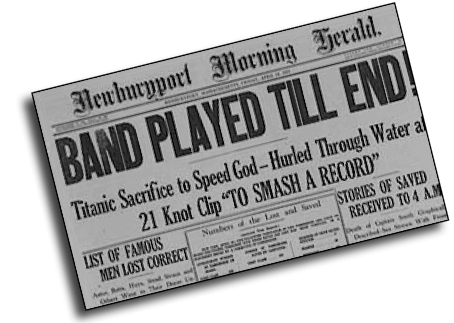 Perhaps the saddest aspect of the Titanic tragedy are the reports that the chamber orchestra played until the very end. In many respects the Titanic tragedy is emblematical of the great ship wreck that is destined to befall the Anglo-American kingdom. That is because the inevitable collapse of the present system is being brought on by foolishness, negligence and arrogance. The political, business and religious leaders of this world have likewise ignored the warnings contained in prophecy. The accumulation of sheer human folly and wickedness is what will ultimately sink the nations and plunge the world into the prophesied genocidal nightmare, otherwise known in the Scriptures as the great tribulation. Jehovah, of course, long ago foresaw the eventual outcome. Interestingly, the prophecy of Ezekiel likens the maritime city-kingdom of Tyre to a sailing vessel, which shocked the world when it figuratively sank in the heart of the open sea. The similarities between Tyre and London are inescapable. No doubt, just as many believed the Titanic was virtually unsinkable, so too, most people are inclined to believe that the present system could never suddenly go down. It is unthinkable. Dare you say: ‘Not even God could sink this ship’?